Less is More: At Forage, delicious small plates result in very long nights. We live in a culinary universe zoned commercial. The endless landscape of fast-food chains and franchises, along with far too many inferior one-offs, are testament to this country’s love affair with edible mediocrity. So, when a restaurant comes along that aims high, I tend to pay attention. I’m not alone. This town has been abuzz since Forage opened in August. In a very short span of time, Forage has titillated many food enthusiasts and disappointed others. I won’t beat around the bush: I’m firmly in the former camp. But I also understand the Forage naysayers and skeptics. Straight up: This is not a restaurant for everyone, nor does it try to be. Forage is the brainchild of chef/owners Viet Pham and Bowman Brown, who’d previously cooked at San Francisco’s The Fifth Floor and Gary Danko restaurants, respectively, before being brought to Utah to open Spark in Provo. The Spark experiment didn’t work out so well, which gave the boys (they are both quite young) the freedom to do their own thing. And do it they have. For starters, Forage is, to my knowledge, the only prix fixe restaurant in the state (unless you count allyou-can-eat buffets). There are two dining options available at Forage: a three-course menu for $39 and a chefs’ tasting menu for $79. It might sound pricey, but the threecourse meal typically turns into six or more, with the addition of an amuse buche and other small bites from the kitchen. The chef’s tasting menu is an absolute bargain, weighing in at around a dozen different courses, depending on the menu, which can change nightly. It’s crystal clear at Forage that food is the emphasis. It’s the star. The small dining space itself is clean and uncluttered; there’s almost nothing, including wall art or music, to distract from the dining experience. It’s not dinner and a show; dinner is the show. The three-act version—starter, entrée and dessert—can even be a lengthy experience. Diners are definitely not rushed at Forage. 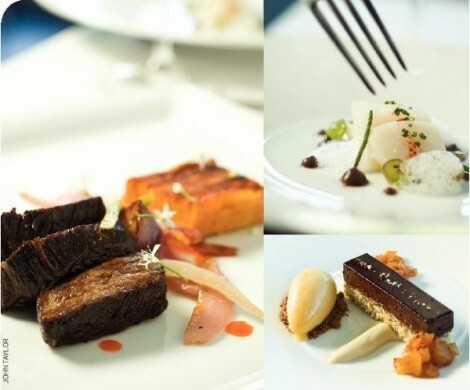 And the chefs’ tasting menu can be a marathon, taking three to four hours to complete. For some, this is a test of endurance; for me, it was luxurious. But I’ll be honest: This is the way I like to eat. I prefer many small courses—lots of different tastes and textures—to the holy trinity of protein, starch and veggies on a single plate. As I said, it’s not for everyone. Over the course of three meals at Forage, I estimate that I’ve tasted somewhere around 30 different “dishes,” ranging from a terrific single-bite amuse buche—a hot, breaded-and-deepfried grape tomato infused with garlic that explodes with flavor in the mouth—to toasted almond semifreddo, with compressed strawberries, strawberry sorbet, coconut and pink peppercorns. To recount all those dishes here would be impossible, so I’ll just hit a few highlights. A single sea scallop is slightly seared, then served sliced, sashimi-style, on a bed of roasted corn, with tiny bits of minced chorizo and jalapeño. It’s just a few small bites, and it is heaven. “Lamb” at Forage might be two seared lamb loin medallions and a rectangle of lamb terrine, with chickpea gnocchi, braised eggplant and cucumber alongside, all lightly dusted with smoked Spanish paprika and sea salt. “Poulet rouge” is chicken two ways: Niman Ranch chicken in a bacon emulsion, and as a thigh terrine, with five or six dainty Napa cabbage leaves strewn about the plate. Atlantic fluke is served in two forms on one plate: raw, as sashimi with minced chives, and tartare-style, coated with popped buckwheat kernels, divided on the plate by a single, perfect slice of poached cucumber. A dessert of local peaches is presented with homemade peach ice cream, pistachio cake, elder flower and oatmeal cream. As you can probably guess, Forage food is all about execution. In fact, I’d say that Forage is more about execution than innovation, insofar as I’ve seen similar dishes or variations on them elsewhere. This is precision food. There is not a wasted grain of salt, nor a single garnish out of place. Forage is a place where small plates equal big flavor: Less is more. For some, though, less is just less. One savvy foodie friend described Forage service as “superb, but too clinical,” and, summarizing his two-and-a-half hour, multi-course dining experience, said, “It was like getting a dozen air kisses, when what I really wanted was some gastronomic tonsil hockey.” Another felt that Forage just didn’t hold his attention for nearly three hours. Those are fair comments. Forage is slow-paced dining and the portions are often bite-size, but there are lots of them. I certainly have never walked away from Forage hungry. As I said, not everyone likes to dine this way. I cherish the opportunity to spend four hours with my wife, just lingering and luxuriating over superbly prepared food. But admittedly, it can be like a lot of foreplay with no real bang! And there is a downside to lengthy dinners like these: It’s really easy to get sloshed if you’re drinking wine the entire time. So I caution you to sip slowly or at least arrange for a cab home. No matter how you cut it, Forage is an exciting addition to the Utah dining scene. I, for one, haven’t been as giddy about a new restaurant since Metropolitan opened over a decade ago. I simply love the place— everything about it. But, your mileage may vary. One thing is certain: If you’re a true lover of food and dining, you’ll be cheating yourself out of a unique eating experience if you don’t foray to Forage.